The economy of Afghanistan has had significant improvement in the last decade due to the infusion of billions of dollars in international assistance and remittances from Afghan expatriates. The assistance that came from expatriates and outside investors saw this increase when there was more political reliability after the fall of the Taliban regime. The nation's GDP stands at about $70 billion with an exchange rate of $20 billion (2017), and the GDP per capita is about $2,000. It imports over $6 billion worth of goods but exports nearly $1 billion only, mainly gold, opium, fruits and nuts. Despite holding over $1 trillion in proven untapped mineral deposits, Afghanistan remains one of the least developed countries on the planet. About 25% of its population is unemployed and lives below the poverty line. Many of the unemployed men join the foreign-funded militant groups or the world of crime, particularly as smugglers. The Afghan government has long been pleading for foreign investment in order to improve Afghanistan's economy. Ancient Afghanistan was one of the most prosperous countries in the world owing to its vibrant trade with Greater India that extended till Bangladesh and beyond. In the early modern period under the rule of kings Abdur Rahman Khan (1880–1901) and Habibullah Khan (1901–1919), a great deal of Afghan commerce was centrally controlled by the Afghan government. The Afghan monarchs were eager to develop the stature of government and the country's military capability, and so attempted to raise money by the imposition of state monopolies on the sale of commodities and high taxes. This slowed the long-term development of Afghanistan during that period. Western technologies and manufacturing methods were slowly introduced during these eras at the command of the Afghan ruler, but in general only according to the logistical requirements of the growing army. An emphasis was placed on the manufacture of weapons and other military material. This process was in the hands of a small number of western experts invited to Kabul by the Afghan kings. Otherwise, it was not possible for outsiders, particularly westerners, to set up large-scale enterprises in Afghanistan during that period. The first prominent plan to develop Afghanistan's economy in modern times was the Helmand Valley Authority project, modeled on the Tennessee Valley Authority in the United States, which was expected to be of primary economic importance. The country began facing severe economic hardships during the 1970s when neighboring Pakistan, under Zulfikar Ali Bhutto, began closing the Pakistan-Afghanistan border crossings. This move resulted in Afghanistan increasing political and economic ties with its northern neighbor, the powerful Soviet Union of that time. The 1979 Soviet invasion and ensuing civil war destroyed much of the country's limited infrastructure, and disrupted normal patterns of economic activity. Eventually, Afghanistan went from a traditional economy to a centrally planned economy up until 2002 when it was replaced by a free market economy. Gross domestic product has fallen substantially since the 1980s due to disruption of trade and transport as well as loss of labor and capital. Continuing internal strife severely hampered domestic efforts to rebuild the nation or provide ways for the international community to help. According to the International Monetary Fund, the Afghan economy grew 20% in the fiscal year ending in March 2004, after expanding 30% in the previous 12 months. The growth is attributed to international aid and to the end of droughts. An estimated $100 billion of aid entered the nation from 2002 to 2017. A GDP of $4 billion in fiscal year 2003 was recalculated by the IMF to $6.1 billion, after adding proceeds from opium products. Mean graduate pay was $0.56 per man-hour in 2010. A fruit vendor at the Kabul International AgFair in 2009. Workers processing pomegranates (anaar), which Afghanistan is famous for in Asia. Afghanistan currently produces roughly 1.5 million tons of fresh fruits annually, which could be increased significantly. It is known for producing some of the finest fruits, especially apples, apricots, cherries, figs, grapes, melons, sweet mulberries, peaches, and pomegranates. Building and using greenhouses is a fast-growing industry in the country. The northern Afghan provinces are famous for pistachio cultivation. In recent years, farmers in the southern and western provinces have also began cultivating pistachios. Provinces in the east of the country are famous for pine nuts. The central provinces are famous for almonds and walnuts. The Bamyan Province in central Afghanistan is also known for growing superior potatoes, which on an average produces 140,000 to 170,000 tonnes. Nangarhar Province is known for oranges, olives, peanuts, and dates. Cultivation of these fruits are now spreading to other provinces in the south of the country. Wheat and cereal production is Afghanistan's traditional agricultural mainstay. National wheat production in 2015 was 5 million tons. Afghanistan is nearing self-sufficiency in grain production. It requires an additional 1 million ton of wheat to become self-sufficient, which is predicted to be accomplished in 2020. The overall agricultural production sometimes declines following droughts. Livestock in Afghanistan mainly include cattle, sheep, and goats. Building and using modern poultry farms is also a fast-growing industry. The availability of land suitable for grazing has traditionally made animal husbandry an important part of the economy. There are two main types of animal husbandry: sedentary, practiced by farmers who raise both animals and crops; and nomadic, practiced by animal herders known as Kuchis. Natural pastures cover some 7,500,000 acres (30,000 km2) but are being overgrazed. The northern regions around Mazar-i-Sharif and Maymana were the home range for about six million karakul sheep in the late 1990s. Most flocks move to the highlands in the summer to pastures in the north. Arable land in Afghanistan is around 8 million hectares. Wheat production stands at about 5 million tonnes, nurseries hold 119,000 hectares of land, and grape production is at 615,000 tonnes. Almond production has jumped to 56,000 tonnes and cotton to 45,000 tonnes, with the saffron yield reaching 2,000 kilograms. The country has plenty of reservoirs, rivers and streams, which make it a suitable climate for fish farming. Fishing takes place in the lakes and rivers, particularly in Nangarhar Province and in the Helmand River in southern Afghanistan. Fish constitute a smaller part of the Afghan diet today because fish farmers are unable to produce enough fish to keep up with the demands of customers. Most fish and seafood are imported from neighboring Pakistan, Iran, and the United Arab Emirates. There are hundreds of fish farms throughout the country and the largest one is at the Qargha, which supplies fish eggs to the other fish farms. Fish farming has also been launched in the Salma Dam. Lumber yard in Asadabad, Kunar Province. Afghanistan's timber has been greatly depleted, and since the mid-1980s, only about 3% of the land area has been forested, mainly in the east. Significant stands of trees have been destroyed by the ravages of the war. Exploitation has been hampered by lack of power and access roads. Moreover, the distribution of the forest is uneven, and most of the remaining woodland is only found in the Kunar, Nuristan and the Paktia regions in the east of the country. The natural forests in Afghanistan are mainly of two types: dense forests of oak trees, walnut trees, and many other species of nuts that grow in the southeast, and on the northern and northeastern slopes of the Sulaiman ranges; and sparsely distributed short trees and shrubs on all other slopes of the Hindu Kush. The dense forests of the southeast cover only 2.7% of the country. Roundwood production in 2003 was 3,148,000 cubic metres, with 44% used for fuel. The destruction of the forests to create agricultural land, logging, forest fires, plant diseases, and insect pests are all causes of the reduction in forest coverage. Illegal logging and clear-cutting by timber smugglers have exacerbated this destructive process. There is currently a ban on cutting new timber in Afghanistan. Prior to 2001 and under Taliban rule, massive deforestation of the country side was permitted and Afghans moved large quantities of logs into storage centers for profit, where the trees wait for processing on an individual tree by tree request. A proportional representation of Afghan exports, 2009. Officials of Afghanistan, Georgia, Turkey, Azerbaijan and Turkmenistan signing the Lapis Lazuli Route agreement in 2016, which will create a new trade route from Afghanistan to the Caucusus and Turkey. Afghanistan's trade with other countries is steadily increasing. Afghan handwoven rugs are one of the most popular products for exportation. Other products include hand crafted antique replicas as well as leather and furs. Afghanistan is the third largest exporter of cashmere. Afghanistan is endowed with a wealth of natural resources, including extensive deposits of natural gas, petroleum, coal, marble, gold, copper, chromite, talc, barites, sulfur, lead, zinc, iron ore, salt, precious and semi-precious stones, and many rare earth elements. In 2006, a U.S. Geological Survey estimated that Afghanistan has as much as 36 trillion cubic feet (1.0×10^12 m3) of natural gas, 3.6 billion barrels (570×10^6 m3) of oil and condensate reserves. According to a 2007 assessment, Afghanistan has significant amounts of undiscovered non-fuel mineral resources. Geologists also found indications of abundant deposits of colored stones and gemstones, including emerald, ruby, sapphire, garnet, lapis, kunzite, spinel, tourmaline and peridot. In 2010, U.S. Pentagon officials along with American geologists have revealed the discovery of nearly $1 trillion in untapped mineral deposits in Afghanistan. A memo from the Pentagon stated that Afghanistan could become the "Saudi Arabia of lithium". Some believe, including former Afghan President Hamid Karzai, that the untapped minerals are worth up to $3 trillion. Another US Geological Survey estimate from September 2011 showed that the Khanashin carbonatites in the Helmand Province of the country have an estimated 1 million metric tonnes of rare earth elements. Regina Dubey, Acting Director for the Department of Defence Task Force for Business and Stability Operations (TFBSO) stated that "this is just one more piece of evidence that Afghanistan's mineral sector has a bright future." Afghanistan signed a copper deal with China (Metallurgical Corp. of China Ltd.) in 2008, which is to a large-scale project that involves the investment of $2.8 billion by China and an annual income of about $400 million to the Afghan government. The country's Ainak copper mine, located in Logar province, is one of the biggest in the world and is expected to provide jobs to 20,000 Afghans. It is estimated to hold at least 11 million tonnes or US$33 billion worth of copper. Experts believe that the production of copper could begin within two to three years and the iron ore in five to seven years as of 2010. The country's other recently announced treasure is the Hajigak iron ore mine, located 130 miles west of Kabul and is believed to hold an estimated 1.8 billion to 2 billion metric tons of the mineral used to make steel. AFISCO, an Indian consortium of seven companies, led by the Steel Authority of India Limited (SAIL), and Canada's Kilo Goldmines Ltd are expected to jointly invest $14.6 billion in developing the Hajigak iron mine. The country has several coal mines but need to be modernized. Afghanistan's important resource in the past has been natural gas, which was first tapped in 1967. During the 1980s, gas sales accounted for $300 million a year in export revenues (56% of the total). 90% of these exports went to the Soviet Union to pay for imports and debts. However, during the withdrawal of Soviet troops in 1989, Afghanistan's natural gas fields were capped to prevent sabotage by the Mujahideen. Gas production has dropped from a high of 8.2 million cubic metres (2.9 × 108 cu ft) per day in the 1980s to a low of about 600,000 cubic meters (2.2 × 107 cu ft) in 2001. After the formation of the Karzai administration, production of natural gas was once again restored. The Port of entry at Shir Khan Bandar in Kunduz Province, near the border with Tajikistan. A locally owned company, Azizi Hotak General Trading Group, is currently the main supplier of diesel fuel, gasoline, jet fuel and LPG in Afghanistan. In December 2011, Afghanistan signed an oil exploration contract with China National Petroleum Corporation (CNPC) for the development of three oil fields along the Amu Darya river. The state will have its first oil refineries within the next three years, after which it will receive very little of the profits from the sale of the oil and natural gas. CNPC began Afghan oil production in late October 2012, with extracting 1.5 million barrels of oil annually. Trade in goods smuggled into Pakistan once constituted a major source of revenue for Afghanistan. Many of the goods that were smuggled into Pakistan have originally entered Afghanistan from Pakistan, where they fell under the 1965 Afghanistan–Pakistan Transit Trade Agreement. This permitted goods bound for Afghanistan to transit through Pakistani seaports free of duty. Once in Afghanistan, the goods were often immediately smuggled back into Pakistan over the porous border that the two countries share, often with the help of corrupt officials. Additionally, items declared as Afghanistan-bound were often prematurely offloaded from trucks and smuggled into Pakistani markets without paying requisite duty fees. This resulted in the creation of a thriving black market, with much of the illegal trading occurring openly, as was common in Peshawar's bustling Karkhano Market, which was widely regarded as a smuggler's bazaar. In 2010, Afghanistan and Pakistan signed into law a new Afghanistan–Pakistan Transit Trade Agreement (APTTA), which allows their shipping trucks to transit goods within both nations. This revised US-sponsored APTTA agreement also allows Afghan trucks to transport exports to India via Pakistan up to the Wagah crossing point. Afghanistan's main land ports are Shir Khan Bandar, Hairatan, Islam Qala, Towraghondi, Torkham, Wesh–Chaman, and Zaranj. From left to right: Indian Prime Minister Narendra Modi, Iranian President Hassan Rouhani, and Afghan President Ashraf Ghani, during the signing of the Chabahar Port transit agreement in May 2016. Afghanistan embarked on a modest economic development program in the 1930s. The government founded banks; introduced paper money; established a university; expanded primary, secondary, and technical schools; and sent students abroad for education. In 1952 it created the Helmand Valley Authority to manage the economic development of the Helmand and Arghandab valleys through irrigation and land development, a scheme which remains one of the country's most important capital resources. In 1956, the government promulgated the first in a long series of ambitious development plans. By the late 1970s, these had achieved only mixed results due to flaws in the planning process as well as inadequate funding and a shortage of the skilled managers and technicians needed for implementation. Da Afghanistan Bank serves as the central bank of the nation. The "Afghani" (AFN) is the national currency, which has an exchange rate of nearly 70 Afghanis to 1 US dollar. There are over 16 different banks operating in the country, including Afghanistan International Bank, Kabul Bank, Azizi Bank, Pashtany Bank, Standard Chartered Bank, and First Micro Finance Bank. Cash is still widely used for most transactions. A new law on private investment provides three to seven-year tax holidays to eligible companies and a four-year exemption from exports tariffs and duties. According to a UN report in 2007, Afghanistan has received over $3.3 billion from its expatriate community in 2006. UN officials familiar with the issue said remittances to Afghanistan could have been more if the banking regulations are more convenient. Additionally, improvements to the business-enabling environment have resulted in more than $1.5 billion in telecom investment and created more than 100,000 jobs since 2003. Afghanistan is a member of World Trade Organization, SAARC, ECO, OIC, and has an observer status in the SCO. It seeks to complete the so-called New Silk Road trade project, which is aimed to connecting South Asia with Central Asia and the Middle East. This way Afghanistan will be able to collect large fees from trade passing through the country, including from the Trans-Afghanistan Pipeline. Foreign Minister Zalmai Rassoul has stated that the "goal is to achieve an Afghan economy whose growth is based on trade, private enterprise and investment". Experts believe that this will revolutionize the economy of the region. Shopping district in the Khair Khana neighborhood of Kabul. As part of an attempt to modernize the city and boost the economy, a number of new high rise buildings are under construction by various developers. Some of the national development projects include the $35 bn New Kabul City next to the capital, the Aino Mena in Kandahar, and the Ghazi Amanullah Khan City east of Jalalabad. Similar development projects are also found in Herat in the west, Mazar-e-Sharif in the north and in other cities. As a competitor of the Coca-Cola Company, the Pepsi-Cola Company is said to be establishing itself in Afghanistan. This not only promotes foreign investment but also makes the country less dependent on imports from neighboring countries and helps provide employment opportunity to many Afghans. Watan Group is a company based in Afghanistan that provides telecommunications, logistics and security services. In February 2019, it was reported that the World Bank granted $235 million to the government of Afghanistan for the country's development and growth. The acting Minister of Finance Humayon Qayoumi said that out of the total amount granted, $75 million will finance "the Tackling Afghanistan's Government HRM (Human Resource Management) and Institutional Reforms (TAGHIR) project, which will strengthen the capacity of selected line ministries. The grant also includes 25 million U.S. dollars from IDA (International Development Association) and 50 million U.S. dollars from ARTF (Afghanistan Reconstruction Trust Fund)." Tourism in Afghanistan was at its peak in 1977. Many tourists from around the world came to visit Afghanistan, including from as far away as Europe and North America. All of that ended with the start of the April 1978 Saur Revolution. However, it is again gradually increasing despite the insecurity. Each year about 20,000 foreign tourists visit Afghanistan. Tourists should avoid areas where armed criminals operate in the name of Taliban. As a policy, the Taliban are known not to harm tourists. Distinguishing the two groups is very difficult. 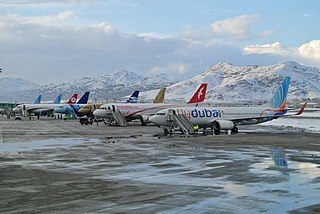 The country has four international airports, including the Hamid Karzai International Airport, Mazar-e Sharif International Airport, Kandahar International Airport and Herat International Airport. It also has several smaller airports throughout the country. The city of Kabul has many guest houses and hotels, including the Serena Hotel, the Hotel Inter-Continental Kabul, and the Safi Landmark Hotel. Guest houses and hotels can also be found in the other cities, including in Bamyan. (PPP) 18.76 Bil. 20.81 Bil. 21.52 Bil.. 24.84 Bil. 26.97 Bil. 31.39 Bil. 33.24 Bil. 40.39 Bil. 44.33 Bil. 48.18 Bil. 55.92 Bil. 60.05 Bil. 62.78 Bil. 64.29 Bil. 66.65 Bil. 69.55 Bil. ^ a b c d "Report for Selected Countries and Subjects". IMF.org. International Monetary Fund. Retrieved 11 January 2019. ^ "January 2019 Global Economic Prospects -- Darkening Skies p. 103" (PDF). openknowledge.worldbank.org. World Bank. Retrieved 22 March 2019. ^ a b c d e f g h i j k l m n o p "The World Factbook". CIA.gov. Central Intelligence Agency. Retrieved 8 February 2019. ^ "Ease of Doing Business in Afghanistan". Doingbusiness.org. Retrieved 2017-01-25. ^ a b c "Afghanistan". The Observatory of Economic Complexity. Retrieved 5 May 2018. ^ "Central Bank Reports Increase In Foreign Exchange Reserves". TOLOnews. 30 March 2019. Retrieved 2019-03-31. ^ a b "Afghanistan Exports To Increase By $1 Billion This Year". Bakhtar News Agency. April 11, 2018. Retrieved 2019-04-11. ^ World Bank Data: Afghanistan. Retrieved 2013-8-14. ^ Asian Affairs Journal, Making Money in Afghanistan: The First Western Entrepreneurs 1880-1919, Vol 3, 2012. ^ "Afghanistan Produces 1.5 Million Tons Of Fresh Fruit A Year". TOLOnews. 12 February 2018. Retrieved 2019-03-31. ^ Making the India Connection. USAID. March 11, 2018. Retrieved 2019-04-17. ^ "Cherry production in Afghanistan". www.actahort.org. 2019. Retrieved 2019-04-11. ^ USAID help farmers to increase the quality and value of grape crops (in Dari). USAID. February 3, 2016. Retrieved 2019-03-30. ^ "Afghanistan: Peaches and nectarines, production quantity (tons)". www.factfish.com. 2017. Retrieved 2019-03-30. ^ Kandahar Green House VOA Ashna (in Pashto). Voice of America. June 24, 2017. Retrieved 2019-04-14. ^ Green house in Khost VOA Ashna (in Pashto). Voice of America. January 15, 2017. Retrieved 2019-04-14. ^ Pistachio Groves Change Lives of Farmers in Afghanistan. World Bank. February 20, 2019. Retrieved 2019-03-30. ^ Taliban makes millions of dollars from pistachio gardens in Badghis (in Dari). Salaam Times. September 6, 2018. Retrieved 2019-03-30. ^ "Bumper pistachio crops this year in Samangan". Pajhwok Afghan News (PAN). August 7, 2010. Archived from the original on March 6, 2014. Retrieved 2012-05-15. ^ Pistachio orchards in Kandahar (in Pashto). Voice of America. July 3, 2018. Retrieved 2019-03-30. ^ Herat Pistachios products grown (in Dari). Voice of America. April 25, 2017. Retrieved 2019-03-30. ^ "Ghani Inaugurates 'Biggest' Smelting Plant In Kabul". TOLOnews. 28 March 2019. Retrieved 2019-03-30. ^ "Afghanistan: Walnuts, production quantity (tons)". www.factfish.com. 2017. Retrieved 2019-03-30. ^ "Bamyan farmers eyeing bumper potato yield". July 30, 2012. Archived from the original on March 6, 2014. Retrieved 2012-11-23. ^ Nangarhar Canal Project Enjoys Bumper Orange Season (in Dari). USAID. December 23, 2017. Retrieved 2019-03-30. ^ Olive Production Nangarhar (in Dari). Voice of America. October 8, 2018. Retrieved 2019-03-30. ^ "Severed Trees in Orchards Mirror Afghan History". The New York Times. July 10, 2010. Retrieved 2019-04-10. ^ "Helmand date trees produce 'significant' yield after grafting". Pajhwok Afghan News. July 15, 2018. Retrieved 2019-04-10. ^ a b "AFGHANISTAN: 2015/2016 Wheat Production above Average but Down from Last Year". U.S. Department of Agriculture. July 17, 2015. Retrieved 2019-04-16. .
^ "Self-sufficiency in wheat production". Afghanistan Times. December 27, 2015. Retrieved 2019-04-16. ^ ښاري انځور خپرونه کندهار ملي راډیو ټلوېزیون (in Pashto). Kandahar Mili Television. February 8, 2019. Retrieved 2019-03-30. ^ Poultry Value Chain in Afghanistan. Comprehensive Agriculture and Rural Development-Facility (CARD-F). November 11, 2018. Retrieved 2019-03-30. ^ "Water & energy sector in critical situation". Pajhwok Afghan News. April 3, 2012. Retrieved 2012-05-15. ^ "Livestock and Fish Farming Bring Self-Sufficiency to Rural Afghans". The World Bank. October 28, 2018. Retrieved 2019-04-16. ^ Fish boom in Jalalabad. AFP News Agency. March 17, 2014. Retrieved 2019-03-30. ^ Ghanizada, ed. (October 29, 2016). "Afghanistan launches fish farming in mega $300m Salma Dam built by India". www.khaama.com. Retrieved 2017-05-16. ^ Trade boost between India-Afghan with air-corridor. DD News. December 27, 2017. Retrieved 2019-03-30. ^ Pajhwok Afghan News, Afghan-US trade up by 34pc in eight months, November 14, 2007. ^ Cashmere Fibres Afghan. USAID. May 25, 2017. Retrieved 2019-03-30. ^ a b Huge rare-earth material in Helmand: USGS Archived 2016-01-24 at the Wayback Machine. By Lalit K Jha for Pajhwok Afghan News. September 15, 2011. ^ "Afghanistan has huge mineral resources: survey". Pajhwok Afghan News (PAN). November 14, 2007. Retrieved 2012-11-23. ^ U.S. Identifies Vast Riches of Minerals in Afghanistan, The New York Times by James Risen. June 13, 2010. ^ "Turning Afghan minerals into wealth could take years; US". Pajhwok.com. 2010-06-15. Archived from the original on 2013-12-04. Retrieved 2012-05-15. ^ "Afghanistan: The Saudi Arabia of Lithium?". News.discovery.com. 2010-06-14. Retrieved 2012-05-15. ^ "Afghanistan says its untapped mineral wealth is at least $3 trillion _ triple US estimate". Chicagotribune.com. Archived from the original on 2010-06-21. Retrieved 2012-05-15. ^ "Afghanistan is suddenly wealthy: US finds $1 trillion in mineral deposits". Ksdk.com. 2010-06-14. Retrieved 2012-05-15. ^ Sengupta, Kim (2010-06-15). "Afghanistan's resources could make it the richest mining region on earth". Independent.co.uk. Retrieved 2012-05-15. ^ Pak Tribune, NASA Confirms Gas, Mineral Reserves In Afghanistan, November 18, 2005. ^ Abdul Qadir Siddiqui, ed. (March 31, 2012). "Indian, Canadian firms to invest $ 14.6b in Hajigak iron mine". Pajhwok Afghan News. Retrieved 2012-03-31. ^ "Gas well inaugurated in Shiberghan". Pajhwok Afghan News (PAN). November 8, 2010. Archived from the original on January 19, 2011. Retrieved 2011-02-09. ^ "Azizi Hotak General Trading Group". Archived from the original on 2008-04-13. Retrieved 2008-04-05. ^ China's CNPC begins oil production in Afghanistan Archived 2013-01-05 at Archive.today, by Hamid Shalizi. October 21, 2012. ^ a b Siddiqui, Abdul Qadir (November 29, 2010). "Afghan-Pakistan chamber of commerce set up". Pajhwok Afghan News. Archived from the original on 2011-07-27. Retrieved 2010-12-10. ^ a b Siddiqui, Abdul Qadir (December 5, 2010). "Pakistan to resolve Afghan traders' problems". Pajhwok Afghan News. Archived from the original on 2011-07-27. Retrieved 2010-12-10. ^ "Peshawar Smuggling Boom". Institute for War and Peace Reporting. 21 February 2005. Retrieved 6 March 2016. ^ Haack, Barry (1998). "Remote sensing change detection of irrigated agriculture in Afghanistan". Geocarto International. 13: 65–75. doi:10.1080/10106049809354643. ^ "Kabul New City Faces Continued Resistance". TOLOnews. 28 August 2013. Retrieved 2019-03-31. ^ "Ghazi Amanullah Khan City". najeebzarab.af. 2009. Archived from the original on 2013-04-29. Retrieved 2011-08-15. ^ A Humane Afghan City? by Ann Marlowe in Forbes September 2, 2009. ^ "Coming Soon To Afghanistan: Pepsi Products". TOLOnews. 23 April 2016. Retrieved 2019-03-31. ^ "World Bank offers Afghanistan 235 mln USD for supporting development". Xinhua. Retrieved 7 February 2019. ^ Bamyan's interesting hotels in the Bamyan TV special report on YouTube, Nov. 22, 2018, Bamyam TV. ^ "Report for Selected Countries and Subjects". www.imf.org. Retrieved 2018-08-25. ^ "Afghanistan Owes More Than $2bn, Finance Ministry Says". Tolo News. October 24, 2011. Archived from the original on April 23, 2012. Retrieved November 16, 2011. The Afghan Ministry of Finance said Afghanistan owes about $2.3 billion to various countries and international organisations. Wikimedia Commons has media related to Economy of Afghanistan. Transport in Afghanistan is limited and in the developing stage. Much of the nation's road network was built during the 1960s but left to ruin during the 1980s and 90's wars. New national highways, roads, and bridges have been rebuilt in the last decade to help increase travel as well as trade with neighboring countries. In 2008, there were about 731,607 vehicles registered inside the country. Mohammad Ashraf Ghani Ahmadzai is an Afghan politician and current president of Afghanistan, elected on 21 September 2014. An anthropologist by education, he previously served as finance minister and the chancellor of Kabul University. Environmental issues in Afghanistan predate the political turmoil of the past few decades. Forests and wetlands have been depleted by centuries of grazing and farming, practices which have only increased with modern population growth. In Afghanistan, environmental conservation and economic concerns are not at odds; with 80% of the population dependent on herding or farming, the welfare of the environment is critical to the economic welfare of the people. In 2007, the World Health Organization released a report ranking Afghanistan as the lowest among non-African nations in deaths from environmental hazards. Chabahar Port is a seaport in Chabahar located in southeastern Iran, on the Gulf of Oman. It serves as Iran's only oceanic port, and consists of two separate ports named Shahid Kalantari and Shahid Beheshti, each of which has five berths. Women's rights in Afghanistan have been a subject of international concern since the 1990s. Through different temporary rulers such as the mujahideen and the Taliban in the 1990s, women had very little to no freedom, specifically in terms of civil liberties. Ever since the Taliban regime was removed in late 2001, women's rights have gradually improved under the Islamic Republic of Afghanistan. Energy in Afghanistan is primarily provided by hydropower. According to the World Bank, approximately 84.1% of Afghanistan's population has access to electricity. Some rural areas, however, do not get 24-hour electricity but this will change once the major CASA-1000 project is completed in 2020. The tourism industry of Afghanistan, developed with government help in the early 1970s, is gradually reviving after the decades of war. A valid passport with visa is required for entrance into Afghanistan. In 1999, the United Nations estimated the daily cost of staying in Kabul at $70 USD. Renewable energy in Afghanistan includes biomass, hydropower, solar, and wind power. Afghanistan is a landlocked country surrounded by five other countries. It is one of the lowest energy consuming countries in relation to a global standing. It holds a spot as one of the countries with a smaller ecological footprint. Hydropower is currently the main source of renewable energy due to Afghanistan's geographical location. Its large mountainous environment facilitates hydro-dams and other facets of hydro energy.